Armed with a fresh, creative voice that is unabashedly cranky one moment and profoundly poignant the next, Ziselman mixes hilarious canine stories, with heartfelt reminiscences from his own life, the results of which is a memoir of illuminating life lessons, courtesy of the three thoroughly Teutonic Dachshunds that he shares his life (and couch) with: Baxter, Maya and Molly. Seemingly mundane moments, like Baxter's incessant, neuroses inducing staring, Maya's inexplicable refusal to walk through the front door and Molly's obsessive compulsive love for a torn and tattered blanket become, through Ziselman's insightful eyes, a treasure trove of observations that any dog-lover will appreciate. In a market where Americans spend more than $40 billion a year on their pets, this work of razor-sharp wit and quiet tenderness will reach out and grab readers everywhere by the heartstrings and-quite possibly-their leashes. Matt Ziselman grew up in Long Island, New York. By the time he was twenty-five, he had worked as a stock boy, cab driver, landscaper, movie theatre manager, nightclub promoter, garbage man, stagehand and other assorted, deeply unfulfilling occupations. In other words, Matt was destined for advertising. First as a copywriter, and later as a Creative Director, Matt has been involved in marketing some of the world's leading brands, where his work has won numerous industry awards. When he's not placed in the awkward position of having to refer to himself in the third person, Matt lives in New Jersey where he tries to keep three Dachshunds, a 12-year old daughter and one wife blissfully happy, but not necessarily in that order. ABSOLUTELY LOVED IT....LIKE YOU WERE EXPECTING LESS? As Ziselman and his dogs grow together, they also develop that special bond that can only come from catering to a small dog. You learn that they rule the house, their wish is your command and you won't have it any other way. 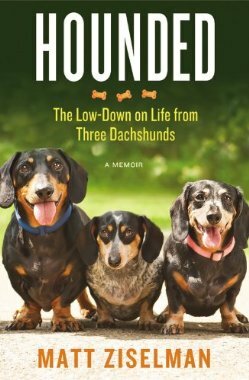 I really enjoyed the humor as well as the little proverbs at the end of each chapter that appear as Dachshund Life Lessons. This is a must buy for dog lovers, particularly those who smile when they hear some one yell, "WIENER DOG! ".